MIUI is the heavily Customized Android ROM having additional features and functions which are not usually available on Stock Android ROM i.e. Change of Themes and Fonts via built-in app, MIUI Stock Apps, Change of Security Settings etc. This MIUI ROM is specially designed and developed by Xiaomi and it came pre-installed on all Mi and Redmi series smartphones and tablets by Xiaomi. MIUI Android Custom ROM is also available for third-party device manufacturers i.e. Huawei, Samsung, Motorola, LG, HTC, Google, ZTE, Sony, Oppo etc. So today we are sharing The Direct Download Links of MIUI Stock Apps APK Collection for Xiaomi device users and as well as for other Android-powered devices. All these MIUI Apps APK are standalone installer, which means, it will work as independent app just like any other Android App without MIUI ROM installed. How to Download, Install or Update MIUI Stock Apps on Xiaomi and Other Android Devices? As we all know that the official App Store app or App Market app of Xiaomi came pre-installed only on MIUI China ROM, and currently it's not available to MIUI Global ROM users, which means MIUI Global ROM users cannot Update MIUI Stock Apps directly through Xiaomi App Store application. The latest MIUI 10 ROM and old MIUI 9 ROM is the current official version released a few months back, but all these MIUI Stock Apps APK standalone installer will also run on older versions of MIUI ROMs and any other Stock Android mobile operating system powered smartphone and tablet devices as well without any issue. Xiaomi Mi and Redmi series device users and other Android users just need to make sure to enable this option from Settings app i.e. “Allow installation of apps from unknown sources” to allow manual installation of MIUI Stock Apps without Google Play Store. 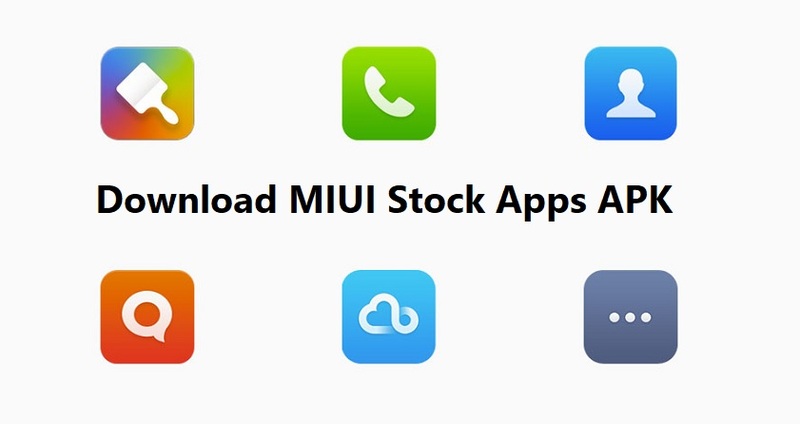 You just need to Download MIUI Stock Apps APK Files via Direct Links available below, then copy, paste and run .apk file on your mobile phone to start installation, upgradations or updations of MIUI Apps without Xiaomi App Store and Google Play Store. Following are 50+ Stock Apps of MIUI Global ROM and MIUI China ROM for Free Download and Manual Installation on any Xiaomi or Android smartphone or tablet devices.